Close to Black Mesa Golf, galleries, nearby restaurants from local eateries to first class restaurants, Buffalo Thunder Casino, museums, ruins, wineries, Bandelier National Park, Hyde Memorial State Park and Rio Grande River rafting. It's a serene paradise nestled in the gorgeous high desert located in the beautiful Pojoaque Valley, crossroads to the best of Northern New Mexico, Santa Fe, Taos, Los Alamos and Chimayo. Enjoy the 1000 square feet private recluse, which includes: a fireplace, kitchen, Queen sized bed, desk area, dining area, two baths with showers, WiFi and a beautiful private heated pool with outstanding views of the magnificent Sangre de Christo mountains, perfect romantic hideaway yet with easy access to highway 84/285. We stayed at this property as part of our honeymoon trip. It was perfect! 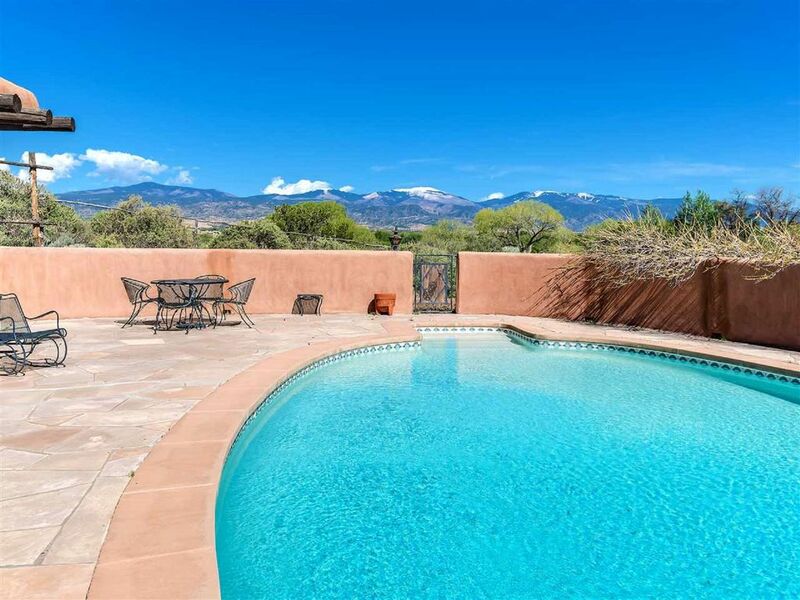 The location is close to Santa Fe, but far enough away to relax and have privacy. We loved having our own spot to enjoy meals together and float in the pool. Kay is amazing! We couldn’t have asked for a better time. Relaxing weekend !Loved the pool! This is our second time coming. Kay is a wonderful host. We enjoyed all there is to do in Santa Fe and then would come back and relax by the pool. Enjoyed some wonderful restaurants , visited breweries and a couple wineries. The setting of this desert getaway is the most attractive component of this rental. The congenial host has nicely appointed the rental with southwestern style furnishings and interesting remodeling choices. The pool and surrounding area is an inviting spot for an outdoor meal or just to relax and unwind. Wonderful place ! Perfect weekend get away! We had a wonderful time. Kay was a such a pleasure to meet and provided us with everything we needed. We plan on coming again! Great retreat and highly recommended!!! Although we have been coming to Santa Fe area for nearly 30 years, this is the first time we stayed in a private casita. And it was a great experience. The owner, Kay, was extremely gracious and helpful, and the casita was fantastic! It was decorated beautifully and comfortably. The bed was wonderful, the location fabulous, and just about every amenity you would need is there. The private pool and patio were just awesome. The picture perfect views were the best. And, the price is much less than you would pay for a nice hotel room. Give it a try and you won't be disappointed.